According to The Water Project (thewaterproject.org), in 2016, there were 783 million people who did not have access to clean water sources. Not having a clean water source greatly increases the mortality rate and drastically decreases the quality of life. Having the opportunity to potentially help with this problem by performing research in a new water disinfection technique this summer has impacted me in many ways, both professional and personal. 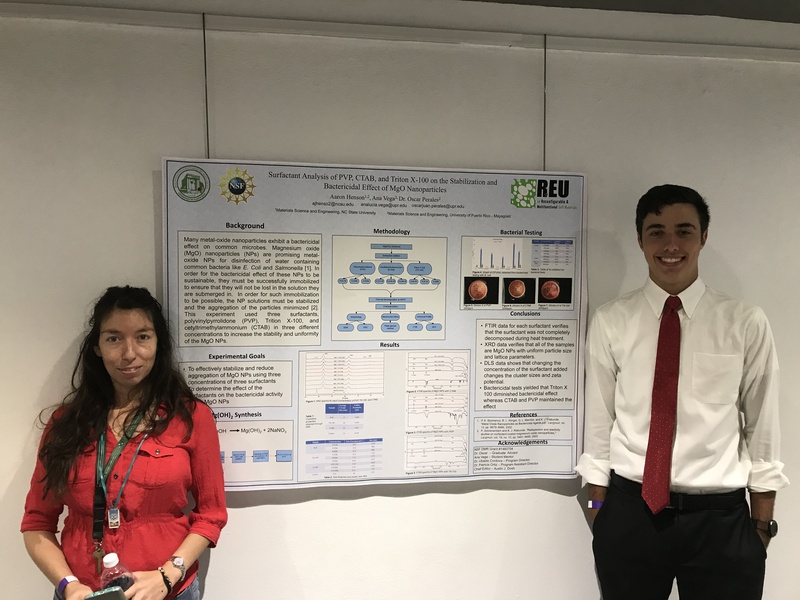 I arrived at UPRM two months ago to participate in the REU program for undergraduate research. In the past two months I have been blessed to experience the rich culture of Puerto Rico and make lifelong friends. Not only have I got experience the joys of life in Puerto Rico, but also I have had the privilege to engage in full-time research and to come alongside my mentor, Ana Vega, in her PhD project. The project became very important to me over the two months I have been here. The theme of the project is not only in line with my professional and academic goals, but also my personal goals. The goal of the project is to use magnesium oxide (MgO) nanoparticles (NPs) to disinfect water contaminated with common bacteria (E. coli, Salmonella, and MRSA) that cause disease and sickness. The problem of not having access to clean water is a tragic and growing problem worldwide. Many metal-oxide nanoparticles produce a bactericidal effect against common microbes found in dirty water like E. coli, Salmonella, and MRSA. MgO NPs were used in this experiment because they don’t require any form of catalysis unlike many other metal-oxide NPs. In order for these NPs to be able to be used as a water disinfection technique, many things must be optimized. One of the first optimizations that was achieved was creating a synthesis of the NPs that generated uniform particles. The second, and more difficult optimization, is the problem of immobilizing the nanoparticles. In order for the particles to disinfect water, they must be added into the water and allowed to kill the bacteria. However, for the water disinfection to be sustainable and efficient, the particles must be immobilized in some fashion. This project plans to load the particles into a biopolymer nanofiber filter. Polyacrylonitrile (PAN) polymer will be electro-spun into nanofibers that form a porous membrane that would act as a filter. The particles will be added to the PAN solution prior to electrospinning so that the nanoparticles will be dispersed and immobilized throughout the fibers of the filter so that when the water passes through, the bacteria become lodged in the filter and the NPs have the opportunity to kill the individual bacteria. In order for the NPs to be correctly loaded into the individual nanofibers, the particles must be completely stabilized in solution. When nanoparticles are in solution, they tend to aggregate with each-other and form large clusters. These large clusters are very large compared to the individual particles and therefore would not be able to be loaded into the nanofibers without rupturing the nanofibers. My project within the project was to come up with a way to decrease the aggregation of the MgO NPs in solution. My hypothesis was that if I were to use a surface active agent, or surfactant, it would help in decreasing the particle aggregation. A surfactant would change the surface chemistry of the particles that it adhered to and could contribute to decreasing the aggregation of the particles. I designed an experiment that I have shown below in Figure 1. As you can see, the plan was to first synthesis the Mg(OH)2 precursor and then add the surfactants. I added PVP, CTAB, and Triton X-100 in the three concentrations that are shown in Figure 1. Once I had added the surfactants to the particles, I heat treated the precursor which resulted in MgO NPs. Once I had done this, I needed to determine first that the surfactant had adhered to nanoparticles’ surfaces and also to determine if it had any effect in reducing aggregation of the particles. Also, I had to test to determine if the surfactants had any effect on the bactericidal effect of the MgO NPs. Once the synthesis and heat treatment were completed, the resulting particles were characterized. First, the particles were characterized using X-ray Diffraction (XRD) to determine that the MgO particles were in the right phase and had the right crystalline properties. The XRD spectra for each sample after heat treatment was what we were hoping to see. All of the spectra were identical and all the peaks of the spectra were located where the theoretical peaks are expected to be. We did not expect to see a change in XRD spectra from the addition of the surfactant because the surfactants are amorphous and therefore don’t have any crystalline properties. Once we did XRD, Fourier Transform Infrared Spectroscopy (FTIR) was performed on each of the samples to determine whether or not the surfactant had successfully adhered to the NPs. The spectra showed that as we added the surfactants, not only did new bands appear that corresponded to the surfactant, but also as the concentration was increased the magnitude of the new bands increased as well. This was encouraging to see that the surfactants had successfully been adhered to the surface of the particles. Next we had to determine the effect of the adhered surfactants on the aggregation of the particles. This was achieved through the use of Dynamic Light Scattering (DLS). We used this technique as a comparison tool to see the difference in the zeta potential and cluster size of the particles with different concentrations of surfactants. The results are shown in Figure 2. As you can see for PVP, as more surfactant was added, the cluster size decreased and the zeta potential increased. This was the same for the second and third samples of the NPs coated with Triton X-100 and the same general trend was observed in CTAB. When compared to the control sample, the highest concentration samples of CTAB and PVP were very effective in reducing the cluster size. Once we had determined that the surfactants had reduced aggregation, we needed to finish by determining if they had any effect on the bactericidal effect of the particles. We tested the particles on E.coli which was prepared through the plate-spread method. We only tested with the three highest surfactant concentration samples. Each sample was tested at 1500 ppm and 2000 ppm and the %inhibition was recorded. It was found that the PVP and CTAB samples actually increased the bactericidal effect. CTAB even increased it by 31% for the 1500 ppm solution. Triton X-100 instead of decreasing the bacterial growth, actually encouraged the growth. We saw an increase in the number of colonies in the samples with the Triton X-100 as compared to the blank sample with no NPs in it. The reason for this is still unknown. To conclude, the experiment that I designed had the goal of reducing aggregation of particles and determining the effect the surfactants had on the bactericidal effect of the MgO NPs. It was found that the surfactants successfully adhered to the surfaces of the nanoparticles and also we were able to decrease the aggregation of the particles. Finally, the bactericidal results yield that CTAB and PVP enhanced the bactericidal effect while Triton X-100 did not. PVP and CTAB are promising surfactants to help achieve the long term goal of the project: to create a sustainable system of water filtration that can be used to help provide the 783 million people who don’t have access with potable water. This summer has changed my view of research and really inspired me to pursue a full-time career in engineering research. One of my primary goals in life is to help suffering people and I firmly believe that engineering systems like this project I have had the pleasure of working on is one of the best avenues to achieve that goal.